We love summer vacation and having fun together as a family! During summer vacation we also try and embed learning into simple crafts and activities to help kids review basic concepts that they'll be learning or reviewing at school in the Fall. Today we are kicking off our third annual Back to School Basics series by sharing a simple name art activity and game using stickers and stamps. Over the next few of weeks I'll be sharing some Back to School Basics posts that review simple math, reading, and writing skills for preschoolers, pre-k students, and kindergarteners. We also will be sharing activities that practice preschool concepts like colors, shapes, alphabet letters, numbers, and name recognition. Today's activity focuses on identifying the alphabet letters in each child's name and matching them in a variety of ways. To get started making this name activity you'll want to cut out the letters of your child's name from cardstock. You can also have your child cut their own name out if they are an older preschooler or kindergartener. Next grab some alphabet stickers and match the correct alphabet stickers to each letter of your child's name. For example, if the first letter in their name is "C" then they would only stick letter C stickers on their cut out letter C.
This is a great visual discrimination activity using a sheet of stickers. If it is too visually overwhelming with your child trying to look at 26 letters, cut the alphabet sticker sheet in half. 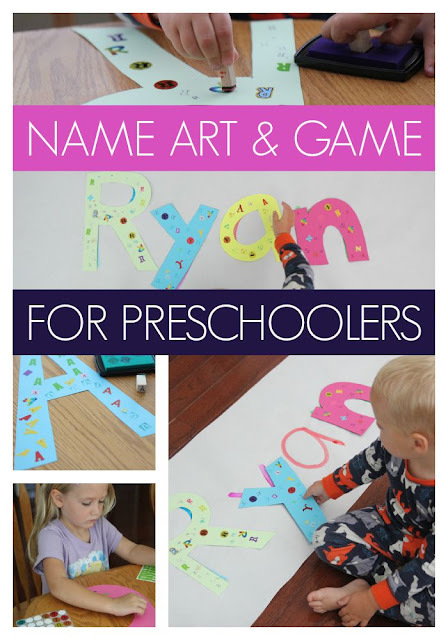 Next, grab some stamp pads and stamps and have your child stamp all over the letters of their name. Make sure to remind them to ONLY stamp letter C on the cardstock letter C and R on the cardstock letter R.
Once kids are all done then roll out your large paper and set up one name matching station for each child. Write their name on the large paper and have them match the colorful paper letters to the correct letter on the paper to spell their name! If your child can write his own name, have him write it on the big paper himself. 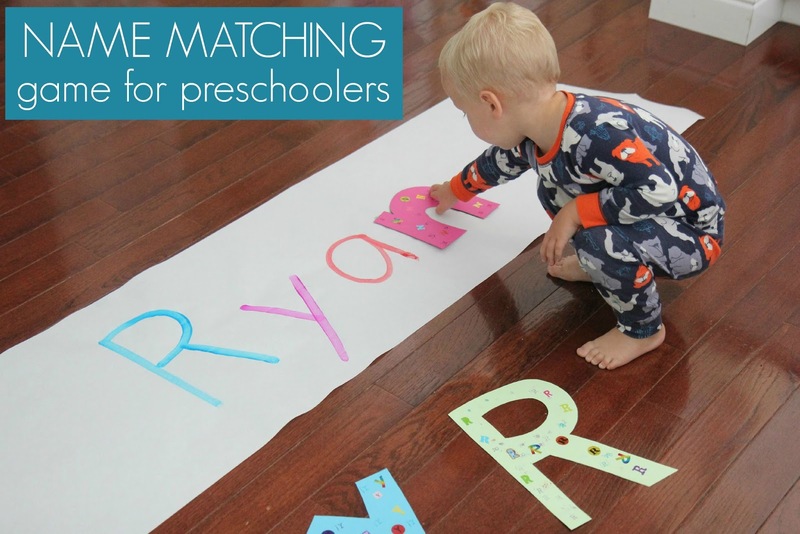 This is a matching activity you can do again and again, so once you are done just roll it up and bring it out another day to play again. Make sure you practice saying the names of the letters while you are spelling their name. You can also talk about the letter sounds and even teach your child a name song. These Name Songs from Preschool Express are our favorites. Need some other ideas for practicing spelling or matching names? 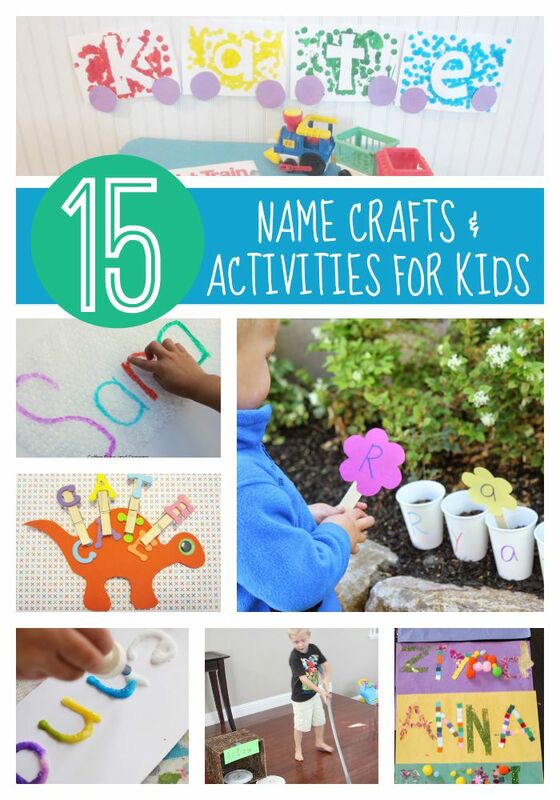 Try out these 15 favorite name activities and crafts. 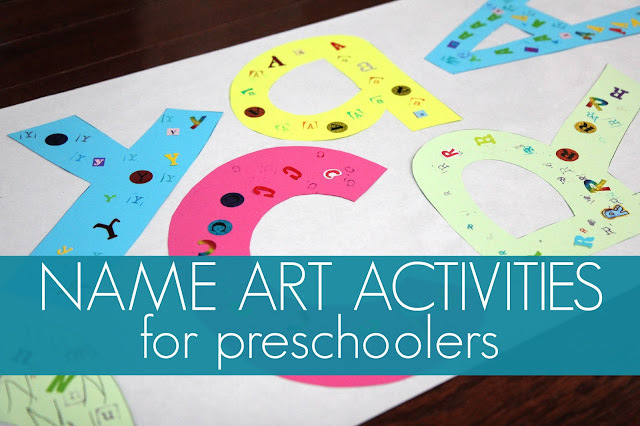 You can find even more ideas on our Name Activities and Crafts Pinterest board. Where did you buy the stickers? We usually buy alphabet stickers at Target in the dollar spot and the Melissa and Doug alphabet stickers are awesome too.